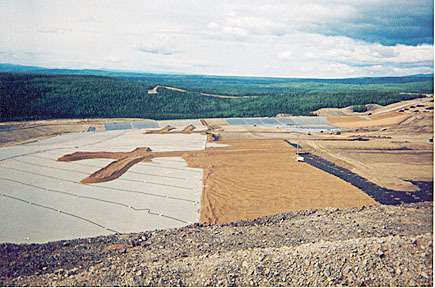 Heap leaching is commonly used in gold, copper, and uranium mining operations to extract minerals from ore. The process typically involves heaping crushed ore on a geomembrane liner and then adding chemicals to the heap by sprinkling or drip irrigation. Layfield Environmental Containment can provide several types of heap leach geomembranes. We recommend Enviro Liner® 4000 and Enviro Liner® 6000HD in 40 and 60 mil thicknesses for heap leaching applications. These geomembranes are highly flexible and are well suited for placement under pads of blasted rock. Both Enviro Liner® 4000 and 6000HD are resistant to cyanide, sulfuric acid, and arsenic and are easily prefabricated and installed. Enviro Liner® 6000HD is fortified with an advanced UV/AO package and is ideal for long-term exposed applications. Enviro Liner® 4000 is also suitable for channels and ponds and for fabricating floating covers for pregnant solution ponds.